I have found that often the extraterrestrials we are meeting now are actually time travelers coming to visit from what we might call The Future. When we are in contact with our Star relatives, we are experiencing more than telepathy. There are feelings being conveyed as well. Such as their empathy for us and our empathy toward them. At our deepest levels we know them, we feel their frequencies and recognize our brotherhood/sisterhood with them. There is a reason why the loving Galactic civilizations are interested in meeting us and communicating with us. They find we are a very powerful group of people who took on the task of experiencing strife and dramatic physical changes on Earth in order to assist the light beings here to evolve as a community of One. Not an easy task, but we are doing it and they are fascinated by how we are proceeding and inspired by our abilities to cope with a myriad of emotions and diverse thoughts. In other words we have put ourselves into a turmoil of frequencies of many different types and speeds and wave lengths and phases to bring calm out of the chaos, to create Balance and Peacefulness. An extraordinary and courageous goal! Since they are time travelers from ‘the future’, they obviously are advanced enough to leap to our present timeline to observe and learn from us how we are doing this. How to take a complicated array of vibrations emanating from multiple cultures and races and bring it into benevolent goodwill and friendliness, compatible with the Earth and the Solar system. Our Star friends often refer to us as their teachers. Our wise Star friends know there are natural worm holes that connect two points in space and time that can be used to time travel to alternate realities, but they also know there are manmade star gates that have been developed on Earth and are being successfully used for journeying in quantum space. Teleportation is a natural development in the evolution of humanity on Earth; i.e. We are meant to enter the other dimensions that exist around us. These are exciting times and Congratulations to you for choosing to be here now! 2004 was the twenty-year anniversary of when the dolphins and whales first made contact with Dolphin Connection. Previously I had listened to their recorded sounds with my friend, John Lilly, M.D. But it was in 1984, after meeting Jean-Luc Bozzoli and seeing his visionary art, that they "spoke" to me personally during a meditation in Belmont, California. From the very beginning the dolphins communicated to me their reasons for becoming more visible, swimming close to shore and meeting residents of planet Earth. They knew they were here to resonate Love and Harmony - assisting the Earth in that way. Their tones, their sonar and their messages were to create balance and compassion in the vibrational frequencies of Earth. They knew they were here to meet in the ocean with aware souls to amplify loving frequencies and encourage cooperation. Many Light Beings such as yourself, became part of the 'pod', meditated and swam with the dolphins, working with them in this outpouring of Love for the good of Earth. The dolphins also told me they are here to prepare humanity for contact with galactic communities. As we learned to love and respect the strange-looking ocean inhabitants called dolphins and whales, we also learned to accept other off-planet, multidimensional civilizations. The dolphins are not original inhabitants of Earth. They come from elsewhere (as documented in my book: Dolphins Into the Future.) As we learn to value their wisdom and loving essence, we learn to discern similar loving frequencies among other Earth-bound extraterrestrials. This is a great service the dolphins and whales have performed. We are grateful for their wake-up call. Now the time has come to welcome another group of E.T.s onto planet Earth. 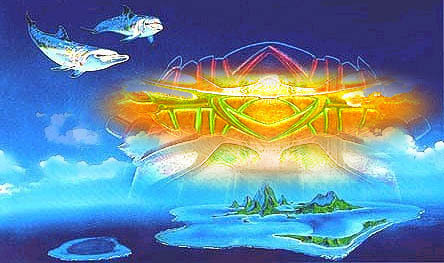 Because of our love for the dolphins, we will recognize the Light Beings who await our call. We will feel their Essence and remember our deep connection to their ancient culture. Please join me as we welcome the friendly galactic cultures from Andromeda at our reunion where we will celebrate our mutual love for Earth. 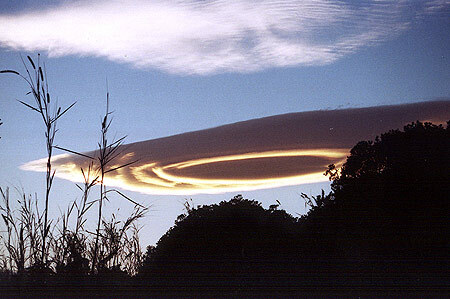 We will gather from August 7 - 19, 2005 at Sky Ranch, Kealakekua, Hawaii. For as long as we can remember, we have known we are here to host the interdimensional, spiritual beings of Love onto planet Earth. These are our relatives, our brother and sister cultures from multidimensional planes and patterns, from other stars and planets. After deep contact with our E.T. relatives in August at the Portal Opening, 2003 we began a specific E.T. 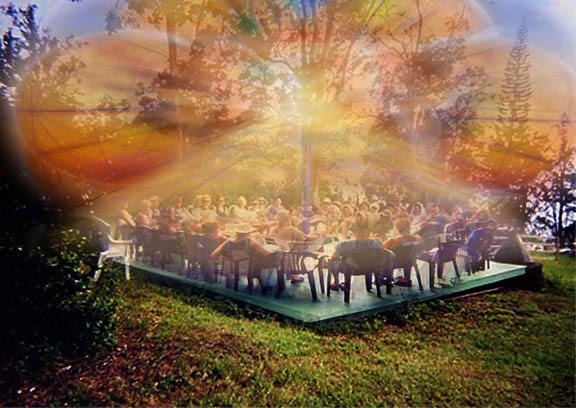 Contact Gathering at Sky Ranch in September to welcome our E.T. friends to Earth and to be healers and counselors in assisting Earth to understand these special loving friends. They are here to assist us if we choose. I am choosing to say Yes to them since the time has come to fulfill our spiritual purposes that the dolphins, whales, angels and Ascended Masters have prepared us for. Please read the entire story below and then if it resonates with you, join with us (wherever you live) to welcome these long-time friends and family onto our home planet, beautiful Gaia. We will continue to convene at Sky Ranch to specifically welcome them as a group. We are guided by Love. It is good to re-connect with you! Channeled by Jean Ederman. Original in French, translation to English by unknown translator. Original title: "Changez Le Monde Par Effet de Levier!, Decidez Si Nous Devons Apparaître!" The author encourages the spreading of this message with these words: "You are free to publish, reproduce and copy this message as you like!, on the contrary, you are invited to do it... but don't modify or cut the message, please." 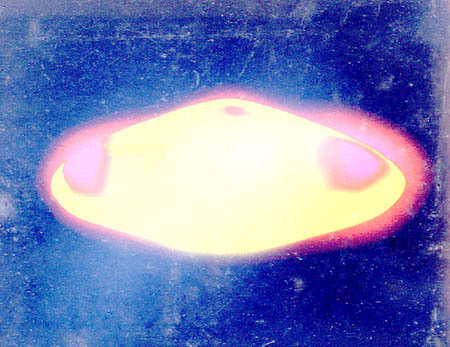 Author's self presentation: "I have seen UFOs for several years and I've had contacts with some ET beings. I am 42, with both a technical education (military jet pilot and air traffic controller), economic (masters) and management (airport manager). From the age of six, I've had various spiritual type experiences that are continually taking on more shape and meaning. 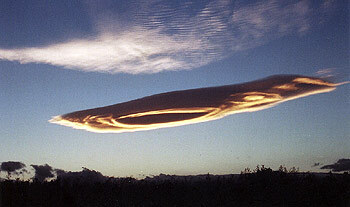 Among the many types of phenomena that have manifested during the last two years, for example when I received a message on the tri-dimensional nature of time (see http://quanthomme.free.fr/energieencore/anglaisericjulien.htm), while a UFO was hanging over my house and had 'announced' its presence by a terrific noise, and then when an enormous triangular craft flew over my house when I was in the process of moving, followed by an aerial battle of lights lasting 25 minutes, and also multiple apparitions of celestial lights and ethereal creatures in my house, and finally, after having learned how to mentally project myself to a place in the presence of benevolent extraterrestrials, I received the following message on behalf of their hierarchy. A growing number of anonymous researchers of yours are exploring new knowledge paths and are getting very close to reality. Today, your civilization is flooded with an ocean of information of which only a tiny part, the less upsetting one, is notably dispersed. Like billions of others in this galaxy, we are conscious creatures that some name "extra-terrestrials", even though reality is subtler. There is no fundamental difference between you and us, save for the experience of certain stages of evolution. Like in any other organized structure, hierarchy exists in our internal relationships. Ours is based upon the wisdom of several races. It is with the approval of this hierarchy that we turn to you. Physically, we are somewhat different from you but for most of us, humanoid-shaped. Our existence is a reality but the majority of you does not perceive it yet. We are not mere observations, we are consciences just like you. You fail to comprehend us because we remain invisible to your senses and measuring instruments most of the time. At certain stages of evolution, cosmic "humanities" discover new forms of science beyond the apparent control of matter. Structured dematerialization and materialization are part of them. This is what your humanity has reached in a few laboratories, in close collaboration with other "extra-terrestrial" creatures at the cost of hazardous compromises that remain purposely hidden from you by some of your representatives. Many human beings have been in visual, auditory, tactile or psychic contact with such ships, some of which are under occult powers that "govern" you. The scarcity of your observations is due to the outstanding advantages provided by the dematerialized state of these ships. The majority of these observations are made on an individual basis so as to touch the soul and not to modify any organized system. This is deliberate from the races that surround you, but for very different reasons and results. We reached the conclusion that freedom is built every day as a being becomes aware of himself and of his environment, getting progressively rid of constraints and inertia, whatever they may be. Despite the numerous, brave and willing human consciences, those inertias are artificially maintained for the profit of a growing centralizing power. Until recently, mankind lived with a satisfying control of its decisions. But it is losing more and more the control of its own fate because of the growing use of advanced technologies, which lethal consequences on the earthly and human ecosystems become irreversible. You are slowly but surely losing your extraordinary capacity to make life desirable. Your resilience will artificially decrease, independently of your own will. Such technologies exist that affect your body as well as your mind. Such plans are on their way. Your history has never ceased to be marked by encounters between peoples who had to discover one another in conditions that were often conflicting. Conquests almost always happened to the detriment of others. Earth has now become a village where everyone knows everyone else but still conflicts persist and threats of all kinds get worse in duration and intensity. Although a Human being as an individual, has many potential capacities, you cannot exercise them with dignity. This is the case for the biggest majority of you for reasons that are essentially geopolitical. Wonderful opportunities of progress stand close to big sub dual and destruction threats. These dangers and opportunities exist now. However, you can only perceive what is being shown to you. The end of natural resources is programmed whereas no long-term collective project has been launched. Ecosystem exhaustion mechanisms have exceeded irreversible limits. The scarcity of resources and their unfair distribution - resources which entry price will rise day after day - will bring about fratricide fights at a large scale, but also at the very heart of your cities and countryside. Human behaviors, formed from past habits and trainings, have such an inertia that this perspective leads you to a dead end. You entrust these problems to representatives, whose conscience of common well-being slowly fades away in front of corporatist interests, with those difficulties. They are always debating on the form but rarely on the content. Who are the "third party" (the Cabal) ? Most of you ignore that non-human entities took part in the exercise of those centralizing powers without them being neither suspected nor accessible to your senses. This is so true that they have almost very subtly taken control. They do not necessarily stand on your material plane, and that is precisely what could make them extremely efficient and frightening in the near future. However, be aware that a large number of your representatives are fighting this danger ! Be aware that not all abductions are made against you. It is difficult to recognize the truth ! That is precisely what those who manipulate you behind the scenes want to avoid at all cost because, by dividing, they reign! They also reign over those who govern you. Their strength comes from their capacity to instill mistrust and fear into you. This considerably harms your very cosmic nature. This message would be of no interest if these manipulators' tutoring did not reach its peak and if their misleading and murderous plans did not materialize in a few years from now. Their deadlines are close and mankind will undergo unprecedented torments for the next ten cycles. We cannot help you overcome your individual and collective fears, or bring you laws that you would not have chosen, work on your own selves, your individual and collective effort to build the world you desire, the spirit of quest to new skies. Do not rush to answer. Breathe and let all the power of your own free will penetrate you. Be proud of what you are ! The problems that you may have, weaken you. Forget about them for a few minutes to be yourselves. Feel the force that springs up in you. You are in control of yourselves ! A single thought, a single answer can drastically change your near future, in one way as in another. One of your thinkers once said: "Give me a hand-hold and I'll raise the Earth". A simple conclusive visual contact would have huge repercussions on your future. Much knowledge would be modified forever. The organization of your societies would be deeply upheaved forever, in all fields of activity. Power would become individual because you would see for yourself that we are living. Concretely, you would change the scale of your values ! The most important thing for us is that humankind would form a single family in front of this "unknown" we would represent! The main difference between your daily prayers to entities of a strictly spiritual nature and your current decision is extremely simple : We are technically equipped to materialize! We know that "foreigners" are considered as enemies as long as they embody the "unknown". In a first stage the emotion that our appearance will generate will strengthen your relationships on a worldwide scale. How could you know whether our arrival is the consequence of your collective choice? For the simple reason that we would have otherwise been already there for a long time at your level of existence ! If we are not there yet, it is because you have not made such a decision explicitly. Some among you might think that we would make you believe in a deliberate choice of yours so as to legitimate our arrival, though this would not be true. What interest would we have to openly offer you what you haven't got any access to yet, for the benefit of the greatest number of you? How could you be certain that this is not yet another subtle maneuver of the "third party" to better enslave you ? Because one always more efficiently fights something that is identified than the contrary. Isn't the terrorism that corrodes you a blatant example? Whatever, you are the sole judge in your own heart and soul ! Whatever your choice, it would be respectable and respected ! In the absence of human representatives who could potentially seduce you into error you ignore everything about us as well as from about those who manipulate you without your consent. Translate and spread this message widely. This action will affect your future in an irreversible and historical way at the scale of millennia, otherwise, it will postpone a new opportunity to choose, to several years later, at least one generation, if it can survive. This message from the extraterrestrials has been distributed throughout the world and many people are choosing to say YES. Please copy and forward this important message to your friends. Our E.T. Contact Group met at Sky Ranch in the evening. We acknowledged the Galactic Council, comprised of many different planes of existence and Light Beings related to the different souls in our E.T. meditation group, which included Sirius, Andromedan, Pleiades, Arcturus, Lyra and others. I shared the E.T. message with the group regarding "Do you want us to show up?" However, the Group was not ready to say, "Yes" to the E.T.s. In fact one person voiced her thoughts that for the first time she realized they are "real" and she wanted to think about what it will mean in her life to meet them. This seemed to reflect the feelings of some others in the group as well. I felt this was an important step toward ET contact for our group. The E.T. message was so powerful that it was clear where it originated and people were now ready to seriously look at the significance of our meeting with the ETs on a physical plane. When I met with Jack the following weekend, I shared with him the ET message (entire) that I had received. He said he wouldn't hesitate. He would say, Yes to their "showing up". We both agreed we don't have to wait, and so we went to the upper pasture to meditate in my tent, make Contact and say, "YES". As soon as we entered the silence, we affirmed our willingness to meet the E.T.s who had contacted us. We asked them to come.. We felt communion and we both felt such strong feelings that tears rolled down our faces due to the deep Love surrounding us. After a few more minutes a huge wind entered the tent, shaking it. It seemed to come from nowhere! Then it subsided, as we felt the presence of a nearby ship. Remaining in silence, no words were spoken. pearly white, iridescent and glowing, beautifully designed. Looking at it, I experienced a deep feeling of peace and inner recognition. It was lightly resting on the ground, twice as big as the Ranch house. The fences and trees did not obstruct the vehicle, as the physical matter merged with the composition of the ship and temporarily disappeared. Turning my head away from it, I saw many people (200 or more) standing to my left, looking at this amazing Ship. My friends of our community of "Dolphinville," stood in a semi-circle, west of the ship, facing it. It was like a still-life photo. No one moved as they observed the ship with wonder. The feelings of curiosity, awe and a little anxiety emanated from the group as they waited. 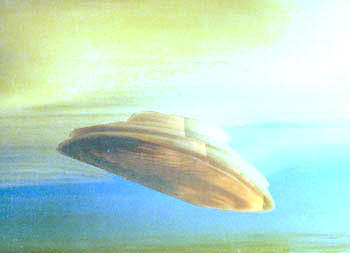 An arched doorway slowly opened on the side of the Ship as five E.T.s emerged from the archway. They matched the fabric of the ship, clad in glowing silver-white body suits. With long, thin arms, they moved delicately. Just outside the Craft they stopped, waiting, quietly relaxed, heads bowed, large, soft eyes looking at us gently. They waited. No one moved. Then I saw a slight movement from the line of people, as the 3 donkeys and horse who live here broke through the line of people and walked slowly, directly to the ETs. Standing right before them, they waited. The horse and the baby donkey nuzzled the ETs. and stood silently next to them. The people seeing that the donkeys were not afraid, now began to move quietly, without hesitation to welcome the E.T.s. It was a very heart-warming moment. I was then shown that the Ranch would be a center for these meetings. I saw certain people who were drawn to be here because they were to be Ambassadors of Peace with the E.T.s from other planets. As a group of humans we would assist each other to understand our spiritual goals and be a support center as many E.T. Ambassadors arrive and open to new ways of knowing and being. We are to create a unique middle ground or reality where we both participate, as in the communication process with the dolphins where we are co-creators. Sometimes when I ask for contact while in my tent at night, I feel a call to go outside. There I meet a glowing interdimensional being. 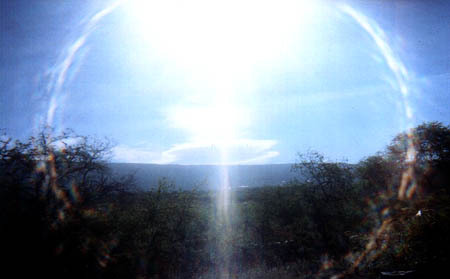 He/she manifests a spinning ball of Light that is suspended in air between us. We both interact (communicate) through that beautiful spinning orb. This is how our communication occurs. It occurs through this spinning light creation that incorporates both of our thoughts, ideas, imagery, knowledge, desires, feelings. We both (all) receive this mutual communication simultaneously. This is a demonstration of how our communication with ETs may unfold. All of our personal ideas and plans are valid. However none of them may materialize as we envision them. As we put our desires and ideas into the pool of possibilities, they coalesce with the wisdom of our friends, the ETs, the Cetaceans, Elves, other people, etc. and a new reality grows from the combined input. It is a reality we can never fully see or comprehend in advance. It changes in each moment. And yet, it is very important that we put our plans into the pool, that we participate fully AND we enjoy the new Reality that unfolds. We are mutually enriched by each other's contributions. Jean-Luc and I will now convene with all of the Ranch entities, people, Elves and E.T.s who would like to meet with us to brainstorm about our mutual interests in Sky Ranch and our common future. Putting all the ideas in a bowl, we will create a recipe for a delicious cake! Every ingredient is part of the finished product. It will be deLIGHTful!!! in co-creating Peace and Divine Light on Earth. and introduce them to Earth people, in the same way we introduced people to dolphins in the ocean. They represent the vast majority of E.T. friends who abide by the Universal Law of "no interference." They are standing by to assist us if we feel it would help the Earth into higher realms of Galactic consciousness. They will only come if we ask and they will depart whenever we tell them to. They are only here to help. Many of us are convening here in Hawaii. Yet, places all over the world will need your help. Let us know where you live and if you have succeeded in initiating contact in your hometown.